Animated musical comedy written and directed by Garth Jennings. The story is set in a world like ours but entirely inhabited by animals. A koala bear named Buster Moon (Matthew McConaughey) who presides over a once-grand theater that has fallen on hard times. Buster is an eternal optimist (and yes, maybe a bit of a scoundrel) who loves his theater above all and will do anything to preserve it. Now facing the crumbling of his life’s ambition, he has one final chance to restore his fading jewel to its former glory by producing the world’s greatest singing competition. So hires a black sheep named Eddie (John C. Reilly), who is also his best friend, to help him run the show. Five lead contestants emerge: A mouse, Mike (Seth MacFarlane), who croons as smoothly as he cons, a timid teenage elephant, Meena (Tori Kelly), with an enormous case of stage fright, an overtaxed mother, Rosita (Reese Witherspoon), run ragged tending a litter of 25 piglets, a young gangster gorilla, Johnny (Taron Egerton), looking to break free of his family’s felonies, and a punk-rock porcupine, Ash (Scarlett Johansson), struggling to shed her arrogant boyfriend and go solo. Each animal arrives under Buster’s marquee believing that this is their shot to change the course of their life. Buster Moon: And cue with the crazy old lizard. Miss Crawley: Good morning, Mr. Moon. I got Judith from the bank on line two. Buster Moon: Actually I’m going to have to call her back. Marcus: You were supposed to be keeping a lookout! Johnny: I was at a rehearsal. Dad, I don’t want to be in a gang. I want to be a singer. Marcus: How did I end up with a son like you? Johnny: I’ll get out! Dad, wait! I’ll get the money, I promise! Buster Moon: My theater has been going through some pretty rough times lately, so what do I do? Buster Moon: No. My next show is going to be, drumroll please… A singing competition! Just think your neighbor, the, the grocery store manager, that chicken, right there! Real talent from real life. Buster Moon: My theater has been going through some pretty rough times, so what do I do? Buster Moon: No. My next show is going to be, drumroll please… A singing competition! Eddie: Who wants to see another one of those! Buster Moon: Everyone! Your neighbor, the, the grocery store manager, that, that chicken, right there! Real talent from real life, that’s what audiences want and I’m gonna give it to them! Rosita: Norman, would you please tell them what a good singer I am. Norman: Oh, yeah. You were great, honey. By the way, the bathroom sink is blocked again. Bye, honey. Meena: Sure you would, Grandpa. Now blow out your candles. Buster Moon: How are we doing with those flyers, Miss Crawley? Mike: I’m here to win. That prize, it’s mine. Buster Moon: This will be the biggest hit show this city has ever seen! Everyone gets a shot at being a star live on my stage. Buster Moon: Are you okay? Gunter: Oh, yes, I’m fine, thank you. How are you? Buster Moon: This is it, folks. You better be ready to work harder than you ever worked in your lives! Eddie: [to Buster] This show is not going to save your theater! Maybe it’s time to just move on. Johnny: Come on! You know how much this means to us! Gunter: You can’t just sing it; you’ve got to show the fire of desire! Rosita: The fire went out a long time ago. Rosita: You are not going to believe what I did today! Johnny: I could really use some extra piano lessons. Miss Crawley: Yes, that was very bad. Buster Moon: A defining moment in all of our lives! Rosita: Are you ready, big guy? Gunter: Yeah, I’m like totally ready. Gunter: We’re going to be spicy, no? Buster Moon: [to Meena] Don’t let fear stop you from doing the thing you love. Buster Moon: You know what’s great about hitting rock bottom, there’s only one way left to go, and that’s up! Gunter: This stage is about to explode with major piggy power! Store Announcer: This store will close in fifteen minutes. Store Announcer: The lady in aisle six, that was awesome. Buster Moon: If you want to become stars and win a hundred grand, then you’d better be ready to work harder than you’ve ever worked in your lives! Meena: I can sing, but I get so scared. Meena’s Grandfather: Come on, be confident! Don’t you want this! Meena: I can’t move! I’m terrified! Buster Moon: Why aren’t you rehearsing? Frog: I’m through! They said I’m an intolerable egomaniac! I don’t even know what that means! 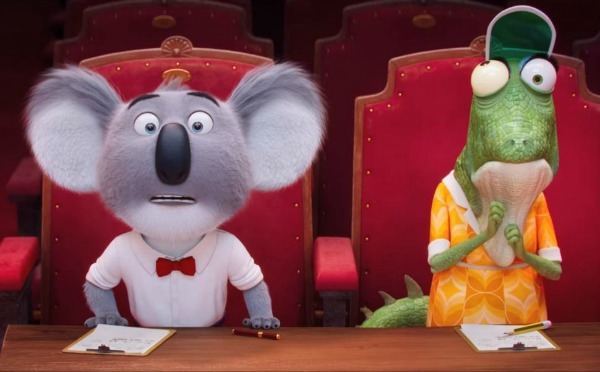 The movie Sing is an animated movie and it also depicts the story very well with the story of a koala sir mooze who has a dream of developing his career in a theatre business as well as fulfilling his father’s dream to do so. In overall I loved the movie and enjoyed it, apart from that it also has a hidden meanings that are very applicable in real life, but there also were a few moments in the movie that I didn’t adore so I would like to give this movie a rating of 7.5 out of 9. Some of the good stuff includes the small details that are not neglected and how well the story goes with the plot, struggle and the meaning of hard work and motivation I also liked the comedy scenes, they are a blast, but the animation is too cut and less realistic to compare with the real life scenario. Lots of stories tangling and easy lives, some scenes were unbelievable. I recently went to watch the movie Sing in cinemas, with popcorn and slushy, it was a great animation, it’s a town full of animals with talent, and one koala bear wants to put their talent to use, what better way than a singing competition? I personally enjoyed this animation, because it’s like a musical with talking Animals, with a hint of comedy, and kids type of action, with a twisting storyline, it has all characters like a normal town, but almost everyone has a talent, from the tiniest mouse to a raging elephant, they have it all. I recommend that it is more in the direction of teens and children that like animation and people who like music of today. I liked it because it has all different animals with their different voices and amazing songs. I hope you enjoy the film like I did, goodbye.